This lipstick pepper spray is a self defense product cleverly disguised in a regular looking lipstick case. It gives you the upper hand in a dangerous situation. Ladies, have you ever felt threatened by someone while you're at a bar, in a mall, or pumping your gas? Do you require a form of defending yourself that's not too big but packs enough punch to thwart an aggressor? Then look no further because the lipstick pepper spray is the item to have! This particular object looks exactly like an attractive perfume or lipstick case, but in fact, it is a powerful pepper spray that will make any aggressor stop dead in their tracks. Small enough to masquerade as a cosmetic, this incredible item is enough to keep an adversary away from you. "My girlfriend works in retail. On certain days, she works from opening time until closing time. I used to feel very uneasy knowing that she didn't have a form of self defense. In an event where there is a customer who likes to get "too close", I'd like her to be prepared. I would love to buy her every form of self defense I can, but, like everyone else, I don't have the means to buy her all of those items. The disguised OC (oleoresin capsaicin) spray seemed the obvious choice. It's compact, cheap, and light. No attacker would ever figure out that it is actually a pepper spray until it's too late. I hope she never has to use it, but knowing that she has it makes the both of us feel better. Ladies, don't ever feel afraid or not in control again. If he makes you feel uncomfortable or afraid, calmly reach into your purse or pocket, pull out what looks like a makeup tube, remove the top and give him a blast of scorching hotness right in the face. Keeping yourself safe is everyone's top priority. Give your safety an extra layer of protection with a surprise weapon that can keep you from getting hurt or worse. 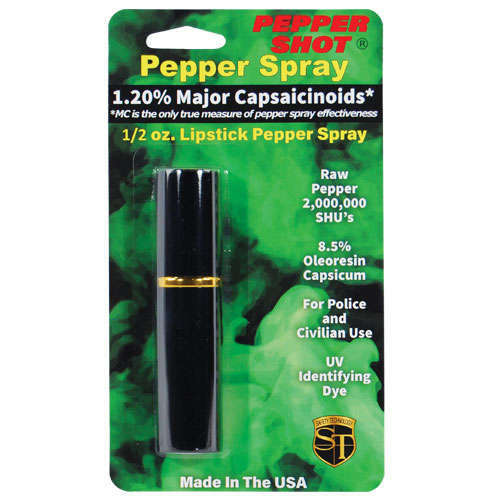 Pepper Shot 1.2% MC 1/2 oz lipstick pepper spray. It's designed for women. The attractive lipstick case is sure to deceive and ward off potential attackers. Pretend you need to freshen your lipstick and POW! This ½ oz canister contains 6-10 one-second sprays with a range of 6-8 feet and is available in 4 colors. - Black, Pink, Red, and Silver. Designed for women, this powerful pepper formula is contained inside a common looking makeup canister that houses a powerful self-protection OC pepper delivery system. It is a convenient and subtle way to carry the protection you need into any environment in which you might find yourself. Contains 5 one second bursts and sprays up to 6 feet. Made by Pepper Shot, a proven and popular brand of pepper sprays. Available in four classy colors. Get one for yourself and for a friend! Lipstick mace can be a very effective and efficient tool to protect yourself from an attacker. But like most self-defense tools, it is only as effective as the person that uses it. If you use it the wrong way, it could cause spray not just to your attacker but also to other innocent bystanders. Worse, it could even get you. Pepper spray contains an irritant found in – what else? – peppers. The substance is called oleoresin capsicum or OC. This is a lachrymatory agent that causes the stinging associated with pepper sprays. It affects the eyes, nose, and mouth. During an attack, you should consider these areas of the face as your main target. The more familiar you are with using your spray, the safer you will be. Know which end is which. In an attack, things can happen in the blink of an eye and if you have to fumble finding the trigger, you will lose precious seconds to protect yourself. Make sure that you practice using the spray. Not necessarily spraying it, but going through the motions of removing the cap and aiming towards your target. In a real situation, you'll automatically do it the right way. Bought a few as gifts for friends. Right size. Elegant look. Superior service as I made a last minute call for change of the order after my order was placed. They are good people to do business with.